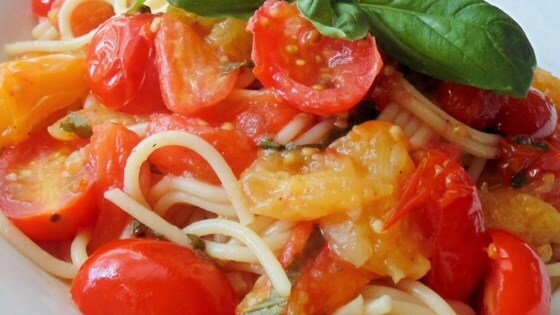 "This is something I threw together one day when I was faced with an abundance of fresh cherry tomatoes and basil from my garden. Delish!" Combine tomatoes, olive oil, garlic, salt, and pepper in a bowl until well mixed; spread on a shallow-sided baking sheet. Bake in the preheated oven until tomatoes are soft and wrinkled, 25 to 30 minutes. Bring a large pot of lightly salted water to a boil. Cook angel hair pasta in the boiling water, stirring occasionally until tender yet firm to the bite, 4 to 5 minutes. Drain; reserving a small amount of cooking water. Spoon tomatoes with their juices into a small saucepan; add basil and red pepper flakes. Mix in reserved cooking water to thin tomato mixture to desired consistency. Cook and stir over low heat until warmed, about 5 minutes; stir in pasta. Top with Parmesan cheese before serving. Grape tomatoes can be substituted for cherry tomatoes. Chicken stock can be used instead of pasta water to thin tomatoes. Tried it with whole grain spaghetti, 4 cloves garlic minced, and dried basil. I've been making this for years. The only change I make is I cook the tomatoes on the stove top. It is delicious, quick and light. Loved this - so simple! I added grilled shrimp on the side for a wonderful summer supper. OMG! This is the best pasta I have had in a long time! I has a bit of a bite to it (which I am totally fine with!). Love all the ingredients and how easy to make. Thank you!